Project RENEW’s MRE staff and young artists from the Hue University’s Quang Tri Chapter pose for a group photo after they have finishing the first mural painting at Cua Viet Kindergarten. 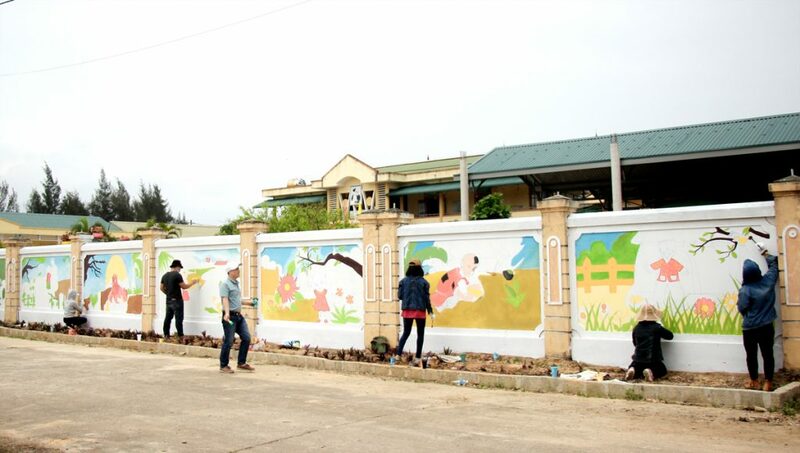 Gio Linh District, Quang Tri Province (18 March 2019): Over 300 preschoolers, parents and teachers of Cua Viet Townlet Kindergarten in Gio Linh District started a new week on Monday with lots of excitement as they walked past pieces of artwork painted on the wall of the school. 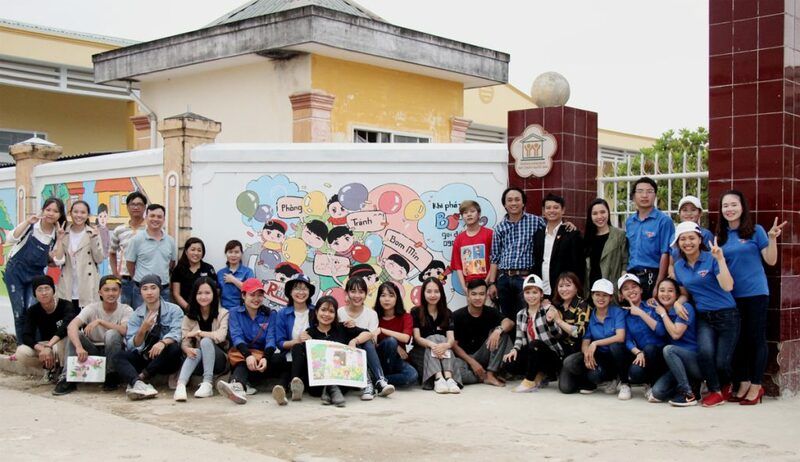 Completed on 15 March 2019, these mural paintings are the result of a new cooperative program between Project RENEW and the Youth Union of the Hue University’s Quang Tri Chapter, using mural artwork in support of Mine Risk Education – – the first of its kind in Vietnam. Hue University’s Quang Tri Branch art students at work at the Cua Viet Kindergarten. 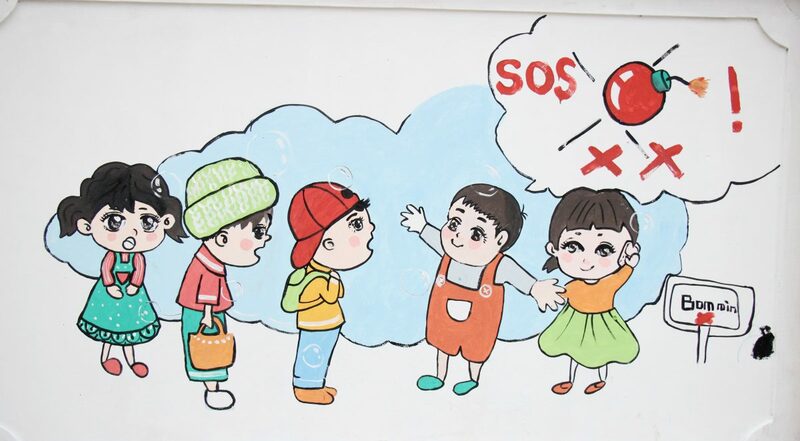 The completion of mural artwork in Cua Viet Kindergarten last Friday officially kicked off the wall-mural artwork project, which is aimed at reinforcing children’s and adults’ awareness of unexploded ordnance (UXO) and emphasizing safe behavior to avoid accidents. 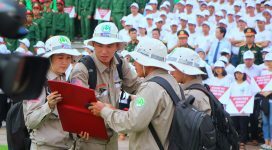 “The cooperative program with Project RENEW enables our students to practice and bring into full play what they have been taught,” said Phan Le Chung, lecturer and secretary of the Youth Union at the College of Arts of Hue University. “More importantly, each and every student feels honored to know that their artwork helps ensure safety for communities from the danger of unexploded bombs,” Chung added. Cua Viet Kindergarten Principal Tran Thi Van said that the mural paintings are child-friendly with clear meaning for local people. “These paintings make our school more beautiful and they convey educational safety messages for the children and their parents,” Van said. 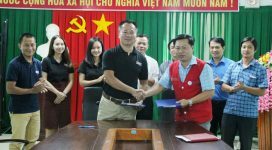 According to Nguyen Thanh Phu, Project RENEW’s Mine Risk Education Officer, with financial support from FJC – A Foundation of Philanthropic Funds, Project RENEW and Hue University’s Quang Tri Branch Youth Union will conduct 17 mural art campaigns in throughout Quang Tri Province. 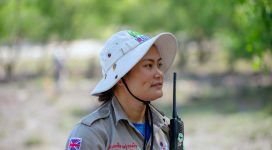 “Wall-mural paintings are an additional education channel to enable our MRE Program, which is currently funded by Irish Aid, to reach more children and their parents,” said Phu. 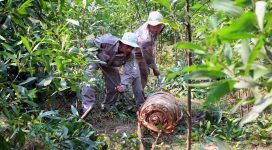 “It is our hope that the outcomes from this pilot project will be replicated in Quang Tri for some years to come,” Phu said.